Crowds walk past a large store sign displaying a Black Friday discount in midtown Manhattan, Nov. 23, 2018, in New York. 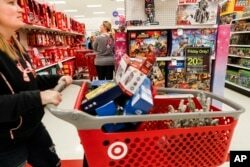 Shoppers browse the aisles during a Black Friday sale at a Target store, Nov. 23, 2018, in Newport, Ky.
Kati Anderson said she stopped at Cumberland Mall in Atlanta on Friday morning for discounted clothes as well as "the people watching.'' Her friend, Katie Nasworthy, said she went to the mall instead of shopping online because she likes to see the Christmas decorations. "It doesn't really feel like Christmas until now,'' said Kim Bryant, shopping in suburban Denver with her daughter and her daughter's friend, who had lined up at 5:40 a.m., then sprinted inside when the doors opened at 6 a.m.
Brick-and-mortar stores have worked hard to prove they can counter the competition from online behemoth Amazon. From Macy's to Target and Walmart, retailers are blending their online and store shopping experience with new tools like digital maps on smartphones and more options for shoppers to buy online and pick up at stores. And customers, frustrated with long checkout lines, can check out at Walmart and other stores with a salesperson in store aisles. BJ's Wholesale Club members Linda Lupien of Marlborough, Mass. 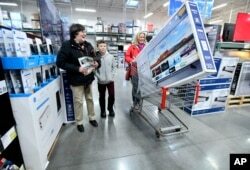 with grandson Jacob Lupien, 10 and his mother, Katy Lupien, of Shrewsbury, Mass., head toward the checkout counter with a new television during BJ's Black Friday sales event, Nov. 23, 2018, in Northborough, Mass. The National Retail Federation, the nation's largest retail trade group, is expecting holiday retail sales to increase as much as 4.8 percent over 2017 for a total of $720.89 billion. The sales growth would be a slowdown from last year's 5.3 percent but yet remain healthy. Black Friday shoppers carry their purchases at the Nebraska Furniture Mart store in Omaha, Neb., Nov. 23, 2018. Target reported that shoppers bought big-ticket items like TVs, iPads and Apple Watches. Among the most popular toy deals were from Lego, L.O.L. Surprise from MGA Entertainment, and Mattel's Barbie. It said gamers picked up video game consoles like Nintendo Switch, PlayStation 4 and the Xbox One. "We boycotted Thursday shopping; that's the day for family. But the experience on Friday is just for fun,'' said Michelle Wise, shopping at Park Meadows Mall in Denver with her daughters Ashleigh, 16, and Avery, 14. People take a break while shopping on Black Friday at Dolphin Mall, Nov. 23, 2018, in Miami. Candice Clark arrived at the Walmart in Louisville with her daughter Desiree Douthitt, 19, looked around and remarked at how calm it all seemed. They have long been devotees of Black Friday deals and for years braved the crowds and chaos. Clark's son, about 10 years ago, got hit in the head with a griddle as shoppers wrestled over it. They saw one woman flash a Taser and threaten to use it on anyone who came between her and her desired fondue pot. 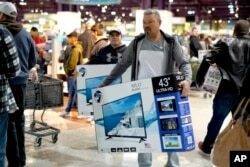 "It seems pretty normal in here,'' said Roy Heller, as he arrived at the Louisville Walmart, a little leery of Black Friday shopping, but pleasantly surprised to find that he didn't even have to stand in line.